6388. Arvilla Jane KACHEL [scrapbook] 1, 2, 3 (Mary Grace BITLER , Samuel Heber , Samuel , Elisha , Daniel , Johannes ) was born on 13 Aug 1926 in Robeson Twp, Berks Co, PA. She died on 11 Nov 2012 in Reading Hospital, West Reading, Berks Co, PA. She was buried in Harmony Methodist Church Cemetery, Joanna, Berks Co, PA.
Arvilla resided in 1930 in Robeson Twp, Berks Co, PA. She graduated from Birdsboro High School. She resided in 1943 in Elverson, Robeson Twp, Berks Co, PA. She worked as At home in 1943. She worked as waitress (22 yrs) with Black Angus Inn from 1969 to 1991 in Ludwigs Corner, Chester Co, PA. She resided 1 in 1997 in Morgantown, Berks Co, PA. She was a member of Harmony United Methodist Church. Arvilla married Donald Hohl JACOBS [scrapbook] 1, 2, 3, son of Harry JACOBS and Bessie HOHL, on 23 Oct 1943 in Joanna, PA. Donald was born on 21 May 1925 in Geigertown, Robeson Twp, Berks Co, PA. He died on 13 Jun 2003 in At Home, Elverson, Chester Co, PA.
Donald resided in 1943 in Geigertown, Robeson Twp, Berks Co, PA. He worked as Laborer in 1943. He was issued a social security number before 1951 in PA. He resided in 2003 in Elverson Chester Co, PA. He worked as Self-Employed Carpenter. He worked as Twin Valley High School - Maintenance Dept until 1988. He was a member of Harmony United Methodist Church in Morgantown, PA. He was a member of Fiendship Fire Company - Lifetime Member in Morgantown, PA. He was a member of American Legion Post 28 - Member in Millsboro, DE. He served in the military with U S Army in WW II. 11639 F i Debra G JACOBS. Debra married Parke M STAUFFER. 6390. John Dickinson "Jonny" MARQUET (John Hensel MARQUET , Annie Jane BITLER , Samuel , Elisha , Daniel , Johannes ). Jonny married Elizabeth Jeannette HARRIS. 11640 F i Kathryn Ellen "Kathy" MARQUET. Kathy married David L STEINMETZ. Kathy also married William Anthony SANDT. + 11641 F ii Jeanne L MARQUET. 6391. 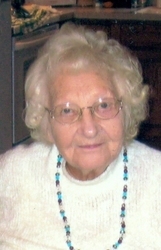 Elizabeth Jane "Betty" MARQUET 1 (John Hensel MARQUET , Annie Jane BITLER , Samuel , Elisha , Daniel , Johannes ) was born on 17 May 1929 in Birdsboro, Berks Co, PA. She died on 16 Mar 2016 in Reading Hospital, West Reading, Berks Co, PA. She was buried in Charles Evans Cemetery, Reading, Berks Co, PA.
Betty resided in 1930 in 208 Furnace St, Birdsboro, Berks Co, PA. She graduated from Birdsboro High School. She graduated from McCann School of Business. She resided in 1940 in 208 S Spruce St, Birdsboro, Berks Co, PA. She worked with Penn Square Mutual. She resided in 1968 in Birdsboro, Berks Co, PA.
Betty married Robert Suplee JAMISON 1, 2 about 25 Jun 1973 in Berks Co, PA. Robert was born on 9 Apr 1920 in West Reading, Berks Co, PA. He died on 31 Aug 2006 in West Wyomissing, Berks Co, PA. He was buried in Charles Evans Cemetery, Reading, Berks Co, PA.
+ 11642 M i Robert Allen JAMISON was born on 12 Jan 1944. He died on 14 Jun 2007. 6393. Anna Margaret MARQUET 1, 2 (Samuel Bitler MARQUET , Annie Jane BITLER , Samuel , Elisha , Daniel , Johannes ) was born on 10 Jul 1919. She died on 21 Mar 1989 in Birdsboro, Berks Co, PA. She was buried in St Michael's Cemetery, Birdsboro, Berks Co, PA.
Anna resided in May 1971 in Birdsboro, Berks Co, PA. She was issued a social security number before 1951 in PA.
Anna married Harvey Donald RIEGNER [scrapbook] 1, 2, 3, 4, 5, 6, son of Harvey Harbold RIEGNER and Laura Susan ESHELMAN, about 27 Jan 1941 in Berks Co, PA. Harvey was born on 21 Feb 1915 in Scarlet's Mill, Robeson Twp, Berks Co, PA. He died on 3 Jul 1995 in Reading Hospital, West Reading, Berks Co, PA. He was buried on 6 Jul 1995 in St Michael's Cemetery, Birdsboro, Berks Co, PA.
Harvey resided in 1920 in Haycreek Road, Robeson Twp, Berks Co, PA. He resided in 1930 in Robeson Twp, Berks Co, PA. He graduated with Birdsboro High School in 1933 in Birdsboro, Berks Co, PA. He resided in May 1950 in Birdsboro, Berks Co, PA. He was issued a social security number before 1951 in PA. He served in the military with U S Navy - Seabee - C.M. 3rd Class in WW II. He worked as Assistant Postmaster - 30+ Yrs in Birdsboro, Berks Co, PA. He was a member of St Mark's Lutheran Church - Member, Financial Secretary, Usher in Birdsboro, Berks Co, PA. He resided in Feb 1985 in Birdsboro, Berks Co, PA. He resided in 1995 in 524 West First St, Birdsboro, PA.
+ 11643 F i Johanne M RIEGNER. + 11644 F ii Suzanne E RIEGNER. 6394. Marion Jeanette HOFFMAN [scrapbook] 1, 2 (Alice Jane BITLER , William Harvey , Samuel , Elisha , Daniel , Johannes ) was born about Dec 1918 in Birdsboro, Exeter Twp, Berks Co, PA. She died on 21 Aug 1999 in Fairmount Homes, West Earl, Lancaster Co, PA. She was buried on 24 Aug 1999 in Cedar Grove Cemetery, Adamstown, Berks Co, PA.
Marion graduated with Reading Hospital School of Nursing in 1939 in West Reading, PA. She worked as Binkley's Grocery Store - Co-Owner from 1941 to 1965 in Blue Ball, Lancaster Co, PA. She worked as Fairmount Homes from 1967 to 1982 in West Earl, Lancaster Co, PA. She resided in Feb 1985 in Blue Ball, Lancaster Co, PA. She resided before Aug 1999 in 1051 Main St, Blue Ball, Lancaster Co, PA. She resided in 1999 in Fairmount Homes, West Earl, Lancaster Co, PA. She worked as Reading Hospital - Registered Nurse in West Reading, PA. She was a member of Cedar Grove Presbyterian Church - Member, Deaconess in East Earl, Lancaster Co, PA.
Marion married Charles Victor BINKLEY 1, son of Clarence R BINKLEY and Mabel GRIFFITH, about 9 Dec 1939 in Berks Co, PA. Charles was born on 27 Jan 1918 in Adamstown, Lancaster Co, PA. He died on 10 Jan 2006 in Garden Spot Village, New Holland, Lancaster Co, PA. He was buried on 13 Jan 2006 in Cedar Grove Cemetery, Adamstown, Berks Co, PA.
Charles worked with Redcay Hat Factory. He worked as Proprietor with Binkley's Store from 1945 to 1965 in Blue Ball, Lancaster Co, PA. He was issued a social security number before 1951 in PA. He resided in 2006 in Blue Ball, Lancaster Co, PA. He resided in 1051 Main St., Blue Ball, Lancaster Co, PA. He resided in 433 S. Kinzer Ave., New Holland, Lancaster Co, PA. He worked as Bus Driver with ELANCO School District. He worked as Janitor with ELANCO School District. He was a member of Cedar Grove Presbyterian Church (Deacon) in Adamstown, Lancaster Co, PA. He was a member of Scottish Rite Bodies in Valley of Reading (32nd Degree). 11645 M i Dr C. Robert BINKLEY. Dr C. Robert BINKLEY married Joyce K WETZLER. 11646 M ii David A BINKLEY. 11647 F iii Linda Jane BINKLEY. Linda married George Osler MACHLAN. 11648 F iv Mary E BINKLEY. Mary married William H LEAMAN Jr.
6395. Alvin Harold "Harold" HOFFMAN 1, 2 (Alice Jane BITLER , William Harvey , Samuel , Elisha , Daniel , Johannes ) was born about 1922 in Mt. Penn, Berks Co, PA. He died on 12 Feb 2013 in Exeter Twp, Berks Co, PA.
Harold resided in Feb 1985 in Exeter Twp, Berks Co, PA. He resided in Aug 1999 in Birdsboro, Berks Co, PA.
Harold married Marguerite DELAQUITO "Rita" on 21 Aug 1946 in Berks Co, PA.
11649 M i Eric Franklin HOFFMAN. Eric married Madeline Irene BECK. Eric also married JoAnn M HARNER. 11650 F ii Melanie A HOFFMAN. Melanie married Joseph A MORRONEY. 6396. Olga Elizabeth BITLER [scrapbook] 1, 2, 3, 4, 5, 6 (Ralph David , William Harvey , Samuel , Elisha , Daniel , Johannes ) was born 1 on 6 Feb 1921 in Reading, Berks Co, PA. She died on 24 Jul 2012 in Garden Spot Village, New Holland, Lancaster Co, PA. She was buried on 31 Jul 2012 in St. Michael's Cemetery, Birdsboro, Berks Co, PA.
Olga resided in 1930 in 407 E 1st St, Birdsboro, Berks Co, PA. She graduated from Birdsboro High School. She resided in 1940 in 407 E 1st St, Birdsboro, Berks Co, PA. She graduated from Albright College (honors, full scholarship) in 1942 in Reading, PA. She resided 1 in 1944 in 407 E 1st St, Birdsboro, PA. She worked 1 as Research Chemist in 1944. She graduated with Masters in Home Economics from Drexel University. She worked as Home Economics teacher (department chair) with Conestoga High School from 1958 to 1993 in Berwyn, Chester Co, PA. She resided in Apr 1985 in Newtown Square, Delaware Co, PA. She resided in Jul 2012 in 433 S. Kinzer Avenue, New Holland, Lancaster Co, PA. She was a member of Trinity Lutheran Church in New Holland, PA. She was a member of Messiah Lutheran Church choir and gospel choir in Broomall, Bucks Co, PA.
Olga married 1 Michael John DUTZER 1, 2, 3, 4, 5, 6, son of Michael DUTZER and Pearl DOBUVSKI, on 29 Jan 1944 in Birdsboro, Berks Co, PA. Michael was born 1 on 13 Apr 1916 in Nanticoke, Luzerne Co, PA. He died on 27 Sep 1996 7 in Delaware Co, PA.
Michael worked 1 as Ensign, U.S. Navy in 1944. He resided 1 in 1944 in 229 Lower Askan, Wilkes-Barre, PA. He was issued a social security number before 1951 in PA.
+ 11651 F i Karol DUTZER was born in Late 40's. + 11652 F ii Karen DUTZER was born in Late 40's. 6397. Edith Josephine BITLER [scrapbook] 1, 2, 3, 4, 5, 6 (Ralph David , William Harvey , Samuel , Elisha , Daniel , Johannes ) was born 1 on 9 Jul 1922 in Birdsboro, Berks Co, PA. She died on 10 Feb 2013 in Garden Spot Village, New Holland, Lancaster Co, PA. She was buried on 16 Feb 2013 in Birdsboro Cemetery, Birdsboro, Berks Co, PA.
Edith resided in 1930 in 407 E 1st St, Birdsboro, Berks Co, PA. She graduated with BS Science and Home Economics from Albright College in 1944 in Reading, PA. She resided 1 in 1948 in 407 E 1st St, Birdsboro, Berks Co, PA. She worked 1 as School Teacher in 1948. She resided in Apr 1985 in Beasley Point, Cape May Co, NJ. She worked as Home Economics with Pottstown Junior High School in Pottstown, PA. She worked as 2nd grade teacher with Daniel Boone Elementary School in Birdsboro, PA. She was a member of Pottstown Garden Club. She was a member of Trinity Lutheran Church. She resided in Jul 2012 in New Holland, Lancaster Co, PA.
Edith married 1 William Allison JAMES Jr 1, 2, 3, 4, 5, 6, 7, son of William Allison JAMES Sr and Cora Abbey KLECKNER, on 12 Mar 1948 in Birdsboro, Berks Co, PA. William was born 1 on 21 Mar 1921 in Reading, Berks Co, PA. He died on 21 Aug 2001 in 17557 New Holland, Lancaster, PA. He was buried in Birdsboro Cemetery, Berks Co, PA.
William resided 1 in 1948 in 1027 Rambler Ave, Pottstown, PA. He worked 1 as School Teacher in 1948. He was issued a social security number before 1951 in PA.
11653 F i Sue Ellen JAMES. Sue married Brian Ronald GOLDBERG. 11654 F ii Elizabeth Ann "Betsy" JAMES. Betsy married John Charles FICKES. + 11655 M iii William Allison JAMES III. 6399. William Eberhard BITLER [scrapbook] 1, 2, 3, 4, 5, 6, 7 (Ralph David , William Harvey , Samuel , Elisha , Daniel , Johannes ) was born 1, 8 on 12 Apr 1927 in Birdsboro, Berks Co, PA. He died on 15 Nov 2015 in Douglassville, Berks Co, PA. He was buried in Birdsboro Cemetery, Union Twp, Berks, PA.
William resided in 1930 in 407 E 1st St, Birdsboro, Berks Co, PA. He served in the military with U.S. Army Air Corps in WW II. He resided in 1940 in 407 E 1st St, Birdsboro, Berks Co, PA. He resided 1 in 1949 in 407 E 1st St, Birdsboro, PA. He worked 1 as Student in 1949. He resided 8 in 1983 in Douglassville, Amity Twp, Berks Co, PA. He worked 8 as Retired in 1983. He worked as School Teacher with Pottstown Area School District & Daniel Boone Area School Dstrict. He resided in Apr 1985 in Douglassville RD1, Berks Co, PA. He resided in Jul 2012 in Douglassville, Berks Co, PA. He worked as National Park Ranger (seasonal). He was a member of St. Mark's Lutheran Church in Birdsboro, PA. He was a member of Union Lodge #479 F&AM. He resided in Feb 2013 in Birdsboro, Berks Co, PA.
William married 1 Mary Jean PENNYPACKER [scrapbook] 1, 2, 3, 4, daughter of Robert Ludwig PENNYPACKER Sr and Edna HEIST, on 24 Nov 1949 in Emmanuel Lutheran Church, Pottstown, Montgomery Co, PA. Mary was born 1, 2 on 3 Apr 1925 in Pottstown, Montgomery Co, PA. She died on 9 Aug 2009 in Berkshire Center, Exeter Twp, Berks Co, PA. She was buried on 12 Aug 2009 in Birdsboro Cemetery, Union Twp, Berks Co, PA.
Mary resided 1 in 1949 in RD#1, Douglassville, PA. She worked 1 as Secretary in 1949. She worked as Secretary with Birdsboro Steel (1940's-1950's). She resided 2 in 1983 in Douglassville, Amity Twp, Berks Co, PA. She worked 2 as Housewife in 1983. She resided in 1991 in Douglassville RD1, Berks Co, PA. She resided in Aug 2009 in Union Twp, Berks Co, PA. She was a member of St. Mark's Lutheran Church in Birdsboro, PA.
+ 11656 M i William Robert BITLER. 6401. Ralph David BITLER Jr (Ralph David , William Harvey , Samuel , Elisha , Daniel , Johannes ). Ralph married Joanne LEFEVRE [scrapbook], daughter of Earl T LEFEVRE and Sara C CALDWELL. 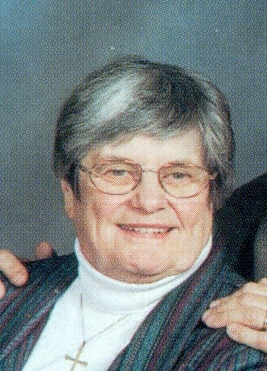 Joanne was born on 14 May 1935 in West Chester, Chester Co, PA. She died on 29 Mar 2010 in Lancaster General Hospital, Lancaster, Lancaster Co, PA. She was buried on 3 Apr 2010 in Trinity Lutheran Church Cemetery, New Holland, Lancaster Co, PA.
Joanne resides in 1954 in RD#4, West Chester, PA. She worked as Secretary in 1954. She resides in Nov 2005 in New Holland, Lancaster Co, PA. She worked as Licensed Practical Nurse with Southern Chester County Medical Center. She worked as Nursing Home Administrator with Harrison House. She is a member of Trinity Lutheran Church in New Holland, PA. She resides in Mar 2010 in 130 E Jackson St, New Holland, Lancaster Co, PA.
+ 11657 M i David William BITLER. + 11658 F ii Elizabeth Joanne "BJ" BITLER. + 11659 M iii Jon R BITLER. + 11660 F iv Mary Ellen BITLER. + 11661 F v Sara Ina "Sally" BITLER. 6403. Grace Winings BITLER (Paul Edward , William Harvey , Samuel , Elisha , Daniel , Johannes ). 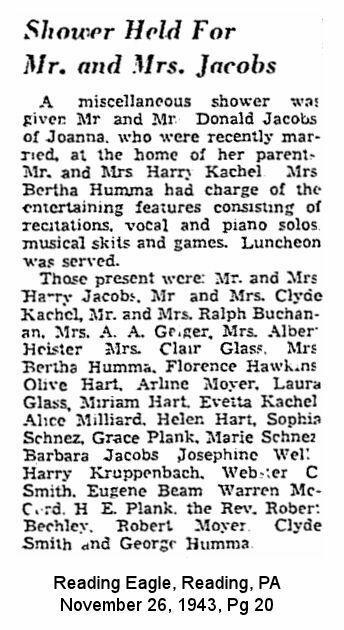 Grace married Martin Delbert SHURR, son of Leon H SHURR and Sarah E BOONE. Martin was born on 30 Jul 1932 in Stonersville, Exeter Twp, Berks Co, PA. He died on 23 Feb 2004 in Berkshire Center, Exeter Twp, Berks Co, PA. He was buried in Schwarzwald Cemetery, Jacksonwald, Exter Twp, Berks Co, PA.
Martin was issued a social security number before 1951 in PA. He resides in 1953 in RD#2, Birdsboro, PA. He worked as Laborer in 1953. He resides in Mar 2004 in Gibraltar Rd, Exeter Twp, Berks Co, PA.
Grace also married Joseph C ARTERS Sr. Joseph was born on 13 Jan 1929. He died on 6 Nov 1995 in Berks Co, PA.
Joseph was issued a social security number before 1951 in PA. He resides in Jul 1987 in Birdsboro, Berks Co, PA.
11662 M i Joseph C ARTERS Jr.
6405. Judith Poole BITLER (George Elwood , William Harvey , Samuel , Elisha , Daniel , Johannes ). Judith married Charles E NICHOLAS "Chuck", son of Christopher NICHOLAS and Mary COMO. Chuck was born on 17 Jun 1938 in Endicott, Broome Co, NY. He died on 18 Dec 2010 in New Britain, Bucks Co, PA.
Chuck worked with Nicholas Market (family store). He was issued a social security number in 1954/1956 in NY. He graduated from Union-Endicott High School in 1956 in Endicott, NY. He graduated with BS Business Administration from Rider College in 1960 in Lawrenceville, NJ. He served in the military with U.S. Navy - U.S.S. Allagash from 1960 to 1962. He worked as personnel assistant and raised to senior vice president of Labor Relations and Human Resources worldwide with Goodall Rubber Company (26 yrs) in Trenton, NJ. He worked as director of labor relations with IMO Industries in Lawrenceville, NJ. He was a member of Bristol Township School Board. He worked as co-owner with Bucks County Concrete technology from 1995 to 2010. He was a member of Mercer County Chapter of the Industrial Research Association. He was a member of Delaware Valley Personnel Association. He was a member of American Society of Personnel Administration. He was a member of Rider College Alumni Association. He was a member of Board of Directors of the Camp Fire Girls. He was a member of Pennsylvania Unemployment Compensation Advisory Board (appointed by Gov. Tom Ridge). 11663 M i Christopher NICHOLAS. 11664 M ii Matthew NICHOLAS.